Team Australia capture final Relay Race Gold, edging out France and New Zealand for Team Title. To see full event results, including team ranking, click here. 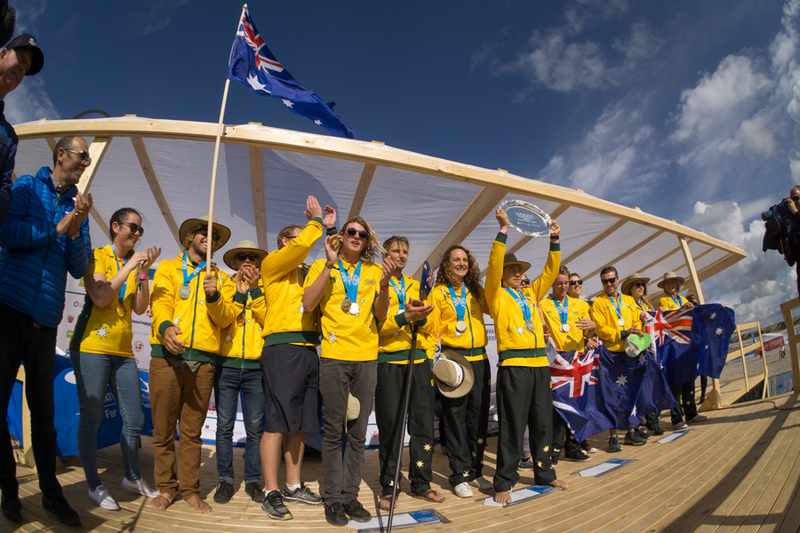 Team Australia capped off a historic week of competition in Denmark and continued their dominance in the ISA World SUP and Paddleboard Championship, edging out France and New Zealand to earn the overall Team Gold Medal. Coming into the Final day of competition in Vorupør, located on Denmark’s northwest coast, Australia held the overall lead in the team points ranking. Their fate was in their hands, as a win in the Team Relay Race would cement their Gold Medal position at the top of the podium. Team Australia jumped out to a lead in the Relay Race that only grew larger lap after lap, earning their fifth Team Gold Medal in the event’s six-year history. Team Australia’s quest for Gold started at the first leg of the World Championship in Copenhagen. They got off to an amazing start with dual Gold Medals in the Paddleboard Distance Race from Lachie Lansdown and Jordan Mercer. As the event moved to the northwest coast known as ‘Cold Hawaii’, Team Australia briefly trailed in the overall team points ranking behind Team France, but after SUP Surfing Gold from Shakira Westdorp and Silver from Harry Maskell, a SUP Technical Race Bronze Medal from Terrene Black, and repeat Gold Medal performances from Lachie Lansdown and Jordan Mercer in the Paddleboard Technical Races, they had gained the lead and never looked back. “We showed our dominance from start to finish. Our whole team put in so much work and I think we deserved this. “Winning Gold is what we come here for. This time around was definitely our most hard-fought Team Gold. There was so much high competition from other countries. It’s awesome to see the growth of SUP and Paddleboarding. “For us to win with this strong field it shows the caliber of our athletes and our team spirit. We always have each other’s back and that goes a long way. Closely following Team Australia in what was the most tightly contested competition for the Team Gold Medal in the event’s history were Team France with the Silver Medal, Team New Zealand with the Bronze Medal, and Team Hawaii with the Copper. The final day of competition at the ISA World SUP and Paddleboard Championship kicked off on Sunday morning with the Team Relay Race Semifinals and Final under partly cloudy skies and an electric vibe coming from the spectators waiting to see a Team World Champion crowned. The first two Semifinals determined who would advance to the Final, which featured Australia, New Zealand, France, Italy, Japan, England, Hawaii, USA, Brazil, and the home nation Denmark. In the Final the race for Gold was over after New Zealand’s SUP racer, Annabel Anderson, fell off her board twice on the second lap, allowing Australia’s Terrene Black to push ahead by 50 meters. Australia’s following legs of the relay, Jordan Mercer and Lincoln Dews, added to the lead gained by Black to earn the Gold Medal. Heading into the Relay Race final lap, the anchor for Team Denmark, Casper Steinfath, was tagged into the race with his team in sixth position. Steinfath made quick work to catch USA and Hawaii who were holding fourth and fifth place. In a display of incredible determination, Steinfath passed star Hawaiian SUP racer, Connor Baxter, to earn an inspirational Copper Medal for the country of Denmark. Team France earned the Silver Medal and Team New Zealand the Bronze in the relay, solidifying their respective second and third positions in the overall team points ranking. The Closing Ceremony followed the end of competition to celebrate the end of a historic week of competition in Denmark and to crown the 2017 World Team Champion. Dignitaries present at the ceremony included, ISA President, Fernando Aguerre, Mayor of Thisted Municipality, Lene Kjelgaard Jensen, President of Friends of Cold Hawaii, Finn Jorsal, and President Danish Surfing & Rafting Federation, Jakob Færch. “We have come to the end of the World Championship, and it’s great because we have had an amazing competition, but sad because now we go back home and say goodbye to our friends and the people of Denmark. I want to thank the organizers, volunteers, and everyone who made this recording-breaking edition of the event possible. “We got everything this week: wind, waves, rain, and sun. We have deep gratitude to the people of Cold Hawaii for hosting us. “This is the largest ISA World SUP and Paddleboard Championship in history. 42 countries, more 450 participants, and more than 700 team visitors gathered here in Denmark. We will all go home as ambassadors of the spirit of the Danish people. “This week we experienced the highest level of competition and camaraderie. We have shared with our friends in Denmark the spirit of the ISA World Championship. ISA and SUP are one and we are going to be sure that it stays that way. The ISA is the only International Federation to organize a World Championship for SUP. SUP is surfing and not canoeing. SUP will continue to flourish in Denmark and around the globe under ISA leadership. The ISA World Championship Series now heads to Japan for the 2017 VISSLA ISA World Junior Surfing Championship in Hyuga from September 23 to October 1. To see photos, video, results from the event, visit www.isaworlds.com. To replay past days’ live webcasts, visit http://isaworlds.com/sup/2017/en/live/. To see full team rankings, click here. Lachie Lansdown (AUS), Jordan Mercer (AUS), Annabel Anderson (NZL) all win their second Gold Medals in Denmark. For daily photos, video highlights, and video news releases, click here. To see full event results, team ranking, and Team Relay Race lineups, click here. Hawaii’s Mo Freitas earned his first-ever ISA Gold Medal to become World Champion in the SUP Technical Race at the 2017 ISA World SUP and Paddleboard Championship in Vorupør, Denmark. Freitas got off to a rough start in the race after falling rounding a buoy on the second lap, moving him out of the lead pack. With what seemed like an insurmountable gap between Freitas and the leaders, Freitas quickly caught back up to salvage his chance of winning Gold. Freitas trailed his teammate Connor Baxter and Denmark’s Casper Steinfath on the final straight away to the beach and in a show of inspiring strength and endurance, he surpassed Steinfath to simultaneously cross the finish line with Baxter. The finish was too close to call, and after moments of replay review it was determined that Freitas had beaten Baxter by two tenths of a second, with Baxter taking the Silver and Steinfath taking the Bronze. “The emotion is just flowing right now,” said Freitas. “So many times I’ve finished in second or third and I’ve finally won. “Connor Baxter is such a great paddler and today I am just overwhelmed with joy. Australia swept the Paddleboard Technical Races with Jordan Mercer and Lachie Lansdown repeating their Distance Race Gold Medal feats accomplished in Copenhagen earning Technical Race Gold in Vorupør on Denmark’s northwest coast. Jordan Mercer, the most decorated ISA athlete of all-time, kicked off the series of four Technical Races Finals with another dominating Paddleboard performance, earning her tenth individual ISA Gold Medal. Lachie Lansdown followed Mercer’s Gold Medal with another Paddleboard Gold for Australia in the Men’s Division. Lansdown and New Zealand’s Sam Shergold seemed to be in another nail-biter, similar to their photo finish in the Paddleboard Distance Race in Copenhagen, however Lansdown was able to push ahead and build a lead, comfortably finishing with the Gold Medal. “This is huge,” said Lansdown. “The Technical Race is the one Gold that I haven’t got yet. I finished second twice, so I am glad that I finally got the Gold. The Women’s SUP Technical Race was once again won by another Gold Medalist from the Copenhagen leg of the event. New Zealand’s Annabel Anderson, the Women’s SUP Distance Race Gold Medalist, continued her dominance in Women’s SUP and handily won the Technical Race, earning another Gold Medal for Team New Zealand. With just the Team Relay Race to decide the Team World Champion on Sunday, Team Australia surged into the lead ahead of Team France and Team New Zealand. Australia has their fate in their own hands, as a Gold in the Team Relay Race on Sunday would lead to their fifth Team Gold Medal in the event’s sixth year. “Today’s SUP Technical Races were nothing short of spectacular. The finish that we witnessed in the Men’s SUP Technical Race may go down in history as the greatest SUP race of all time. “The world’s best SUP and Paddleboard racers pushed the limits of the sport to new levels today. This ISA World Championship allows the best SUP athletes to show the world their talents. The ISA continues to be the only international federation running SUP World Championships. “The race in the team point standings is as close as ever and the Team title is going to come down to tomorrow’s Team Relay. This will mark a historic moment for the sport as the first Gold Medalist in the event’s history will be crowned in Europe." To view the week’s full event schedule, click here. The event will be streaming live September 1-10 on www.isaworlds.com. After a historic day of SUP Surfing that resulted in Australia’s Shakira Westdorp and Brazil’s Luiz Diniz claiming the Women’s and Men’s individual Gold Medals, the 2017 ISA World SUP and Paddleboard Championship will not run on Friday and will shift its focus towards a weekend of Technical and Relay Races that will determine who will be crowed Team World Champion. To see full event results, team ranking, and Technical Race Final lineups, click here. In the event’s sixth year, the team that claims the coveted Club Waikiki-Peru World Team Champion Trophy will go down in history as the first to earn the honor in Europe. Team France, the 2016 Silver Medalist, currently holds the Gold Medal position and will have a great chance to build upon their lead with all of their SUP and Paddleboard Technical racers having qualified for the Finals. The four-time Team Gold Medalist Australia is sitting in the Silver Medal position, intent on defending their Team Title. The Australians will rely on their star paddleboarders who took Distance Race Gold in Copenhagen, Lachie Lansdown and Jordan Mercer, to repeat the feat in the Technical Race to keep their hopes of the Team Gold alive. The SUP and Paddleboard Technical Races are set to kick off at 12:00pm CEST in the town of Vorupør located on Denmark’s northwest coast. The top SUP and Paddleboarders in the world are set to compete and go for Gold, such as Denmark’s local standout, Casper Steinfath, Hungary’s brother duo, Daniel and Bruno Hasulyo, New Zealand’s strong Women SUP racers, Annabel Anderson and Penelope Strickland, Hawaii’s Connor Baxter and Mo Freitas, and the strong French SUP contingent of Olivia Piana, Amandine Chazot, Arthur Arutkin, and Titouan Puyo. The top SUP in the world are set to compete and go for Gold, such as Denmark’s local standout, Casper Steinfath. Photo: ISA / Ben Reed. Kicking off on September 1 in Copenhagen, the 2017 edition of the ISA World SUP and Paddleboards Championship has made history as the largest SUP World Championship to date. The 286 athletes from 42 countries is more than a 100% increase in participation from the 2016 edition in Fiji and the thirteen first-time competing nations are representative of the ISA’s push to reach new markets and grow the sport of SUP globally. 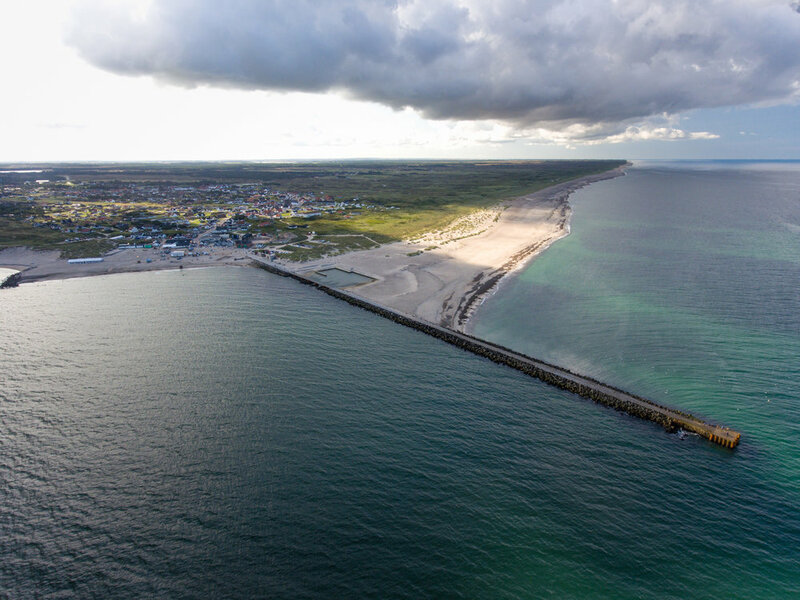 After two days of Distance Racing and SUP Sprints in Copenhagen, the contest moved to the renowned watersport destination of Vorupør in the country’s northwest to run the SUP Surfing, Technical Races, and the Relay Race from September 5-10. “Our time here in Denmark has been nothing short of spectacular. Past Gold Medalists have continued their dominance and new athletes have emerged into the global spotlight, using this World Championship as a platform to show the world their talent. “The 2017 edition has been special for the ISA because our years of hard work towards developing the sport of SUP is bearing fruits and taking the sport to new levels. We hope to continue riding this wave of growth all the way to the Paris 2024 Olympic Games and beyond. To view the full event schedule, click here. For daily photos, video highlights and video news releases, click here. Australia’s Shakira Westdorp repeated as the Women’s SUP Surfing World Champion, following up on her historic 2016 performance in Fiji, while Brazil’s Luiz Diniz burst into the international spotlight in his first appearance in the event, bringing a Gold Medal to Team Brazil at the 2017 ISA World SUP and Paddleboard Championship in Vorupør, Denmark. The two-time ISA SUP Surfing Gold Medalist, Westdorp, expressed her excitement with her teammates on the beach. “I am so stoked! I just want to congratulate all the competitors. “The conditions changed from gnarly to pretty good this afternoon, so it was awesome I was able to showcase my skills in varying conditions. “The level of women’s SUP surfing is going through the roof and being on the top of that is pretty special. I am over the moon right now. Luiz Diniz, a relatively unknown surfer at an international level, made a name for himself and etched his name forever among the first ISA SUP Gold Medalists crowned in Europe. Brazil’s Luiz Diniz burst into the international spotlight in his first appearance in the event, bringing a Gold Medal to Team Brazil. Photo: ISA / Ben Reed. “I am super stoked for this win”, said Diniz. “Thank God for bringing me here and giving me hope. I've been taking it heat by heat and I felt pretty comfortable throughout in my first ISA World Championship. Heading into the final weekend of competition, with just the Technical Race and Team Relay remaining, Team France has held onto their lead in the overall team points ranking. An all-around performance, with medals in the Men’s and Women’s Divisions from Benoit Carpentier and Justine Dupont, solidly maintained their lead with five medals left to be awarded. Thursday morning on Denmark’s northwest coast known as ‘Cold Hawaii’ greeted the competitors with blustery, onshore conditions that provided a solid increase of swell into the waist to chest high range. Soon after heats got underway, the wind turned around 180 degrees with a light offshore, creating excellent conditions to crown World Champions. After a morning of high performance Surfing and national pride radiating from the beach, the Men’s and Women’s Final took place. The Men’s Final featured the 2016 runner-up Mo Freitas (HAW), Harry Maskell (AUS), Benoit Carpentier (FRA), and Luiz Diniz (BRA) contesting the Gold. Brazil’s Luiz Diniz jumped out to the lead with wave scores of 6.77 and 5.70, earning a heat total of 12.47. Hawaii’s Mo Freitas threatened Diniz’s lead, trailing by less than a point. Freitas made a crucial mistake and committed an interference, which resulted in his second highest wave score being halved and all but erasing his hopes for a Gold Medal. Freitas ended the heat in fourth position with the Copper Medal, France’s Benoit Carpentier in third with the Bronze, Australia’s Harry Maskell in second with the Silver. The Women’s Final concluded the historic day of competition, with the defending World Champion Shakira Westdorp (AUS) getting off to a blazing start. Her first two wave scores turned out to be all she needed, taking the Gold Medal for the second consecutive year with a heat total of 11.87. France’s Justin Dupont earned the Silver, USA’s Emily Merrill the Bronze, and Brazil’s Aline Adisaka the Copper. “What an incredible day of competition! This morning the waves showed up, the wind went offshore, and the world’s best SUP surfers took full advantage. “Cold Hawaii lived up to its name, with some cold weather and excellent Surfing conditions. Shakira Westdorp and Luiz Diniz will forever go down in history as the first SUP Surfing ISA World Champions crowned in Cold Hawaii, Denmark, and Europe. 2016 Defending Gold Medalists Zane Schweitzer (HAW) and Shakira Westdorp (AUS) in top form, notching Wednesday’s top heat totals. To see full event results, click here. 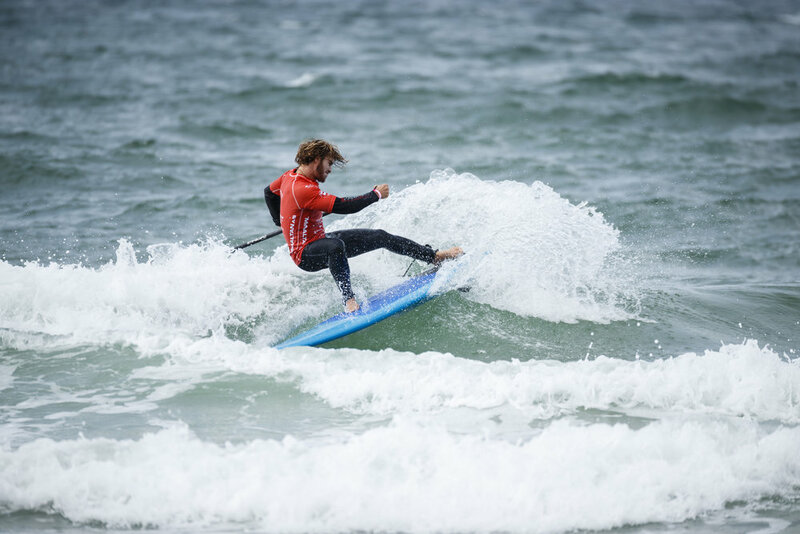 The world’s best SUP surfers took to the water and displayed their elite talent on the fourth day of competition on Denmark’s northwest coast at the 2017 ISA World SUP and Paddleboard Championship. Athletes battled through challenging, onshore conditions in Vorupør, setting the stage for the SUP Surfing World Champions to be crowned on Thursday. Hawaii’s Zane Schweitzer, who claimed his first ISA SUP Surfing Gold Medal in an epic day at Cloudbreak, Fiji in 2016, asserted himself as one of the top contenders to go for Gold in Denmark. Schweitzer showed excellent technique and wave selection, earning the top two-wave heat total of the day with 14.70. “I have no doubt that Hawaii has a chance to win the overall Gold,” said Schweitzer. “We already have a medal under our belt with Connor Baxter medaling in the Distance Race and we excel in the Technical Race and SUP Surfing, which are coming up in the next few days. Two other top SUP surfers that shined in the Men’s opening round were Brazil’s Caio Vaz and France’s Benoit Carpentier. Both surfers expertly navigated the unorganized wind swell, with Vaz earning the day’s second highest heat total (14.50) and Carpentier scoring the highest single wave (8.17). The Defending Women’s SUP Surfing Champion, Shakira Westdorp, also displayed top form with the highest two-wave total with 12.83, advancing her comfortably through the opening Women’s Round to defend her title on Thursday. Izzi Gomez, the 2015 Gold Medalist and 2016 runner-up has yet to compete and will begin her campaign to reclaim the Gold when the Women’s Round 1 resumes on Thursday morning. Due to the small window of contestable waves on the forecast, the competition reverted to a single elimination format to take full advantage of the peak of the swell on Thursday morning. As a result, the athletes had to put it all on the line, with 42 competitors being eliminated between the Men’s and Women’s events. Nikolay Nikolov was one of the men eliminated in Round 1, however he made history as the first Bulgarian athlete to ever compete in an ISA World Championship. Nikolov was unable to advance, however his participation signifies a large step for the ISA’s global growth and development of SUP in non-traditional SUP nations. “The conditions were challenging today but the world’s best SUP surfers showed why they are the best, able to perform at a high level no matter what the conditions are like. Tomorrow we’ll see SUP Surfing World Champions crowned, the first ever in Europe. Thursday’s SUP Surfing will start on 6:30am CEST. To view the full schedule and heat lineups, click here. Casper Steinfath (DEN), Jordan Mercer (AUS), Lachie Lansdown (AUS), Annabel Anderson (NZL) among many top athletes to contest Technical Race Gold. Technical Races got off to a blazing start on Tuesday in Cold Hawaii in the North of Denmark, setting the stage for four highly anticipated, star-studded Finals in the 2017 ISA World SUP and Paddleboard Championship. The world’s top SUP and Paddleboard racers shined in the town of Vorupør, competing for a place in the Finals to tentatively take place on Saturday afternoon. The local sensation, Casper Steinfath (DEN), put on an outstanding performance to earn his pass to the Final, looking to win his second Gold Medal for the host nation after earning the SUP Sprint Gold Medal in front of thousands in Copenhagen on Sunday. “I am finally competing in front of my local crowd at home. It’s incredible,” said Steinfath. The Finals are stacked with the world’s top SUP and Paddleboard talent, such as Australia’s stellar Paddleboard duo, Jordan Mercer and Lachie Lansdown, New Zealand’s Annabel Anderson, Hawaii’s Connor Baxter, the Hungarian brothers Daniel and Bruno Hasulyo, and France’s Olivia Piana. Piana will attempt to earn her first Gold Medal in the SUP Technical Race discipline after having earned the Silver Medal on two occasions (2013, 2016). Jordan Mercer, who recently overcame a family tragedy and a broken board to go on to win the Gold Medal at the Women’s Paddleboard Technical Race in Copenhagen, expressed her joy to win her Semifinal heat and be competing in a location as stunning as Cold Hawaii. “My board feels great. I am happy to be on my own craft after discovering that it was broken and I might not be able to use it. It’s what I’ve trained on and am used to. In the second Men’s SUP Technical Race Semifinal, Christian Andersen, the 16-year-old Danish prodigy, showed amazing poise and after falling back into eighth place, surpassed three competitors to finish in fifth, the final advancing position. The local crowd exploded in cheers as Andersen crossed the finish line. Andersen will now advance to the Final with the goal of becoming the youngest competitor to ever finish in a podium position in the six-year history of the event. New Zealand, currently situated in the Team Gold Medal position, will remain in the top spot after Tuesday’s competition, not losing any competitors. An inspiring moment from Tuesday’s racing occurred in the Men’s Paddleboard Semifinal. Argentina’s Sebastian Bressen finished last in the race, but was brought to tears of pride and joy when he met his team upon crossing the finish line. “Being here and representing Argentina is the greatest prize, the rest is all just the outcome of being here,” said Bressen. “Winning and losing is what happens, but the joy comes from knowing my team is there waiting for me on the beach. and a month ago they asked me to compete. Usually I am just a coach, so I only was able to train for a month, but I decided to do it. “Cold Hawaii provided the perfect platform for the world’s best SUP and Paddleboarders in today’s Technical Racing. The locals and the international delegations were heard all day supporting their athletes in the Semifinal races. To see the heat lineups for the SUP Surfing, click here. New Zealand, France, and Australia take early lead after Copenhagen leg of event. After a historic weekend of Distance and Sprint Racing in the Danish capital of Copenhagen, the 2017 ISA World SUP and Paddleboard Championship brings the best SUP and Paddleboard athletes in the world to Denmark’s rugged northwest known as Cold Hawaii from September 5-10. The record-breaking 286 athletes from 42 countries travelled to the town of Vorupør, a haven for watersports in Denmark, to compete in the disciplines of SUP Surfing, Technical Race, and Team Relay Race. The Cold Hawaii leg of the competition will determine who will be crowned Team World Champion, the first ever crowned in the country. Two days of action packed racing in Copenhagen over the weekend crowned six World Champions in the disciplines of SUP and Paddleboard Distance Race and SUP Sprint Race, most notably crowning the local standout and ISA Vice President, Casper Steinfath, the SUP Sprint Gold Medalist in his home country. While six of the event’s thirteen Gold Medals have been awarded, over half of the medals are still up for grabs. New Zealand, France and Australia have respectively assumed the top three positions thus far, however with seven medals yet to be contested, the Team Gold Medal is still open for the taking. The visiting National Delegations were greeted to a warm welcome in Vorupør on Monday evening with an official Ceremony celebrating the Championship coming to Cold Hawaii and the peaceful gathering of nations through SUP and Paddleboard. Dignitaries in attendance at the Ceremony were ISA President, Fernando Aguerre, Chairman of Friends of Cold Hawaii, Finn Jorsal, Mayor of Thisted, Lene Kjelgaard, and Founder of Plastic Change, Henrik Beha Pedersen. “This is the first championship of its kind to take place in Europe it is set to break participation records. Nearly 300 athletes from over 40 countries will test their strengths against the waves of Cold Hawaii. “I am proud to conclude that we succeeded in arranging this event in a quite untraditional cooperation between the nation’s capital, Copenhagen, and the fishing village of Vorupør on the coastline of Cold Hawaii. It’s commendable that the small village of Vorupør play such a major role in this event. ISA President, Fernando Aguerre, closed the Welcome Ceremony with a message for the hundreds of onlookers and athletes present. “These last three days have really changed the landscape of watersports in Denmark. We enjoyed the three days in Copenhagen with amazing conditions and competition at the iconic Opera House. “If you would have told me in 2012, the first year of this event, that we would have more than 500 team members and officials participating in this event, I wouldn’t have believed it. We went from 14 to 42 nations and yesterday the entire country was watching live on national television. The ISA has been leading this global growth and development of SUP. To see the heat lineups for the Technical Race Semifinals, click here. Local sensation, Casper Steinfath overcame a second-place finish in the semi-final to deliver a commanding gold-medal performance in the 200-meter SUP Sprint Race Final. Photo: ISA / Ben Reed. Slovenia’s Manca Notar takes Women’s SUP Sprint Gold, exemplifying global growth of sport. Local sensation, Casper Steinfath overcame a second-place finish in the semi-final to deliver a commanding gold-medal performance in the 200-meter SUP Sprint Race Final to close a spectacular weekend of SUP racing in Copenhagen at the 2017 ISA World SUP and Paddleboard Championship. The spectacular win by Steinfath in front of an energetic and vocal home crowd was also carried live on Danish national television. 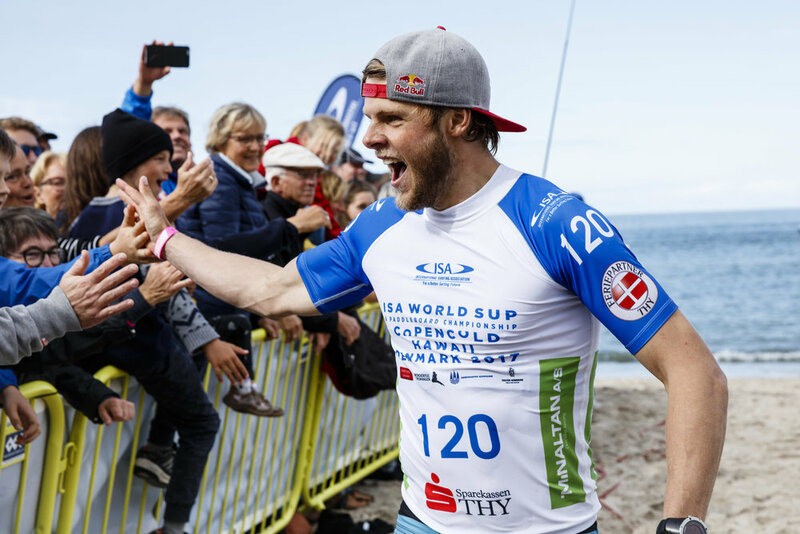 Steinfath’s victory was another historic moment for the sport of SUP and Denmark. The spectacular win by Steinfath in front of an energetic and vocal home crowd. Photo: ISA / Ben Reed. The SUP Sprint Gold Medal is the second consecutive Sprint Title and fifth ISA SUP Racing Title for Steinfath, who also has been a leader in advancing the sport of SUP, serving as the ISA Vice President since 2014. “People talk about Denmark as the country of fairy tales and I feel the fairy tale of my life just came true. To win in front of my home crowd was just a wild dream. I thought I would never achieve it. “I’m especially stoked after my first-round heat where I hit a wall and barely made the Finals. Casper Steinfath, a local of Cold Hawaii, will now look ahead to the SUP Technical Race to take place in Vorupør between September 5-10, just kilometers from his home town of Klitmøller. In the Women’s SUP Sprint Final, Slovenia’s Manca Notar put on a dominate performance, beating the rest of the field by a decisive three-second margin. Notar’s Gold Medal exemplifies the growing reach of the sport in non-traditional SUP nations, just a day after Hungary’s Bruno Hasulyo won the first ISA SUP Gold Medal ever for a land-locked nation in the Men’s Distance Race. With just over 40 kilometers of coast in Slovenia, Notar’s performance symbolizes another significant leap forward for developing SUP nations. The SUP Sprints kicked off on Sunday morning with sunny skies and a light breeze at the Copenhagen Opera House. The 42 participating National teams lined the harbor to root on their athletes competing for Gold Medals. The Men and Women featured four Semifinal heats each, with the top two of each heat advancing to the eight-person Finals. The SUP Sprint Semifinals entered the water first with France’s Amandine Chazot (1:08:80) notching the fastest time for the Women and Latvia’s Arvis Iljins (0:56:97) the fastest for the Men. Notably, yesterday’s Women’s SUP Distance Race Gold Medalist, Annabel Anderson (NZL), fell off the pace of the second Sprint Semifinal placing third and missing out on a shot at the podium. During the first of the Men’s Semifinals the local Danish crowd held their breath as Casper Steinfath got off to a slow start and came across the finish line in a photo finish for second place with Hawaii’s Connor Baxter. The spectators anxiously awaited Steinfath’s result, and let out a boisterous cheer when it was announced that he had edged out Baxter by inches to take the advancing second place position. Steinfath’s finish in the Final didn’t leave any doubt for the judges, pulling ahead of the field by a full board length. New Zealand’s Trevor Tunnington followed with the Silver Medal, Brazil’s Artur Santacreu with the Bronze, and Australia’s Lincoln Dews with the Copper. Manca Notar also displayed stunning acceleration in the Women’s Final, finishing well ahead of France’s Amandine Chazot who earned the Silver Medal. USA’s Jade Howson and Japan’s Yuka Sato respectively finished with the Bronze and Copper Medals. After the competition, an award ceremony followed to honor the first SUP Gold Medalists crowned in Copenhagen and bid farewell to the enchanting city that hosted the first leg of the event. “What a couple of days here in Denmark. 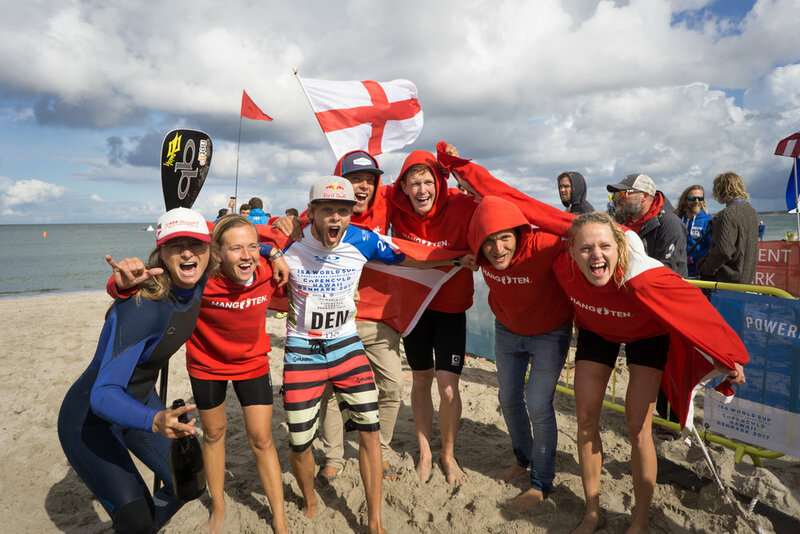 It’s been a week of firsts: The first time for this event in Europe, the first time Denmark has hosted an ISA event, first SUP World Championship with gender equality, the first time a Danish woman has won a medal, and the first time that Casper Steinfath has won a Gold Medal at home. That’s truly special. “Thanks to everyone that has been with us all these days. This is a bittersweet moment because we had such a great time in this city walking the streets, riding bicycles, and enjoying the culture. Today we wrap up the event in Copenhagen and go to Cold Hawaii to experience the beautiful northwest coast of Denmark.